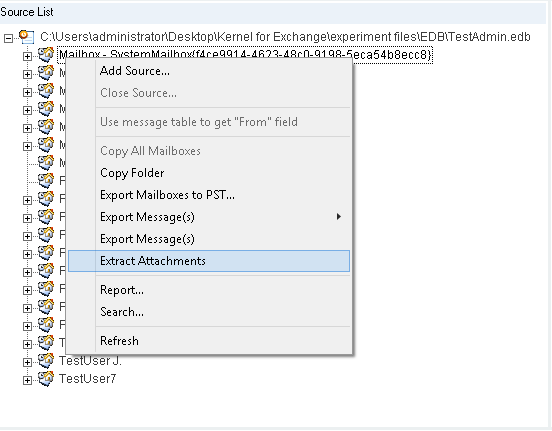 Recovers Exchange mailboxes (including deleted items) from corrupt EDB files. It lists all the mailboxes of Exchange Database in the source list. It can recover exchange mailboxes after the event of Dirty Shutdown, or other corruption reasons. 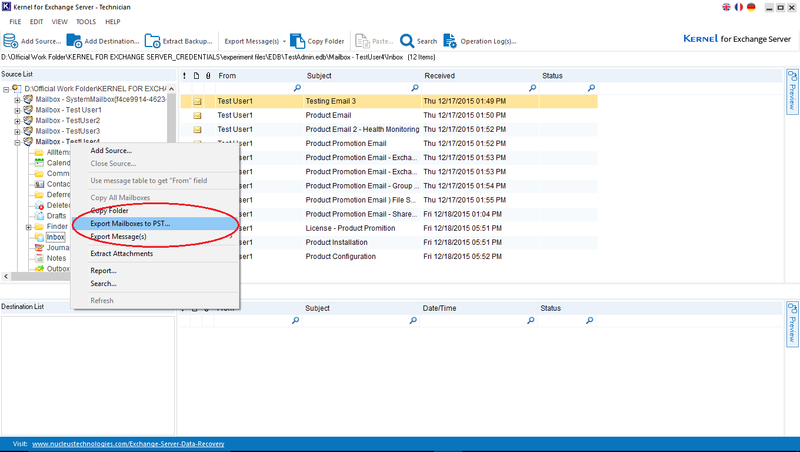 Export your EDB mailboxes to MS Outlook PST file. The tool allows full preview of mailbox items before exporting them to the desired location. You can migrate EDB file to any version of MS Outlook (including Outlook 2016). 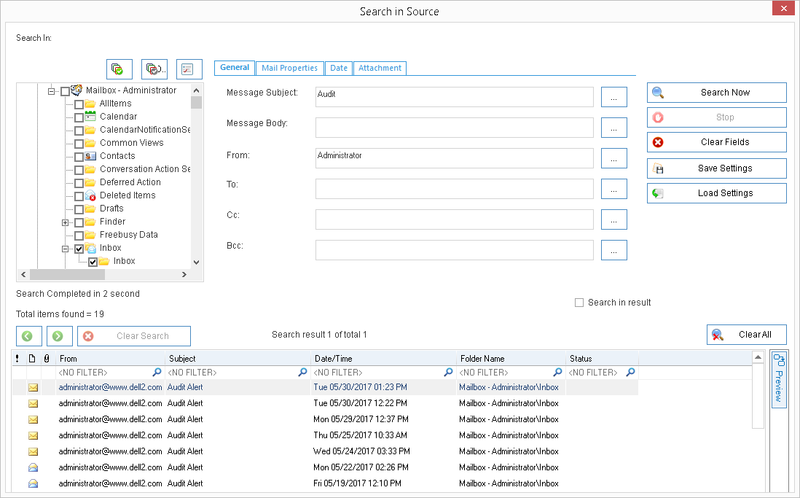 You can run a search for a specific item across multiple selected mailboxes (including EDB file, live Exchange, Office 365) simultaneously. You can search messages with a specific phrase/word, and find any attachment by its name, type, size etc. Also, you can preview the content of searched items there itself. The searched results can also be exported to the various destinations. 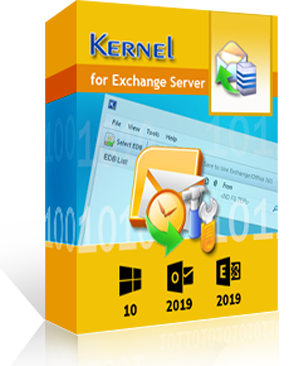 You can easily migrate your user mailboxes from old Exchange version to newer Exchange version with kernel for Exchange Server. 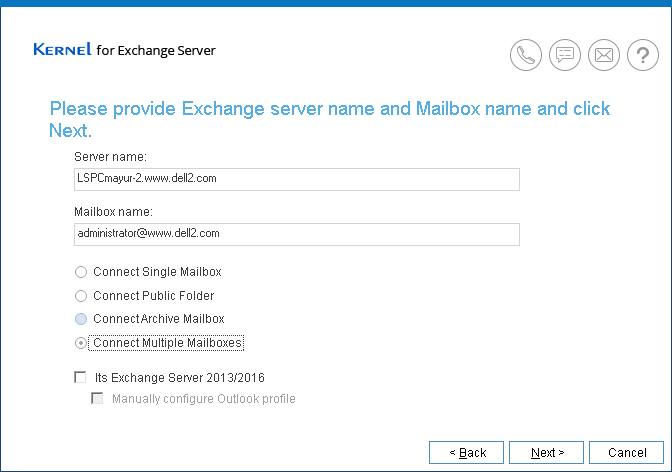 The tool allows to migrate single/multiple mailbox(es), public folders, archive mailboxes of Exchange Server. You can also connect to remote mailboxes and migrate them simultaneously. 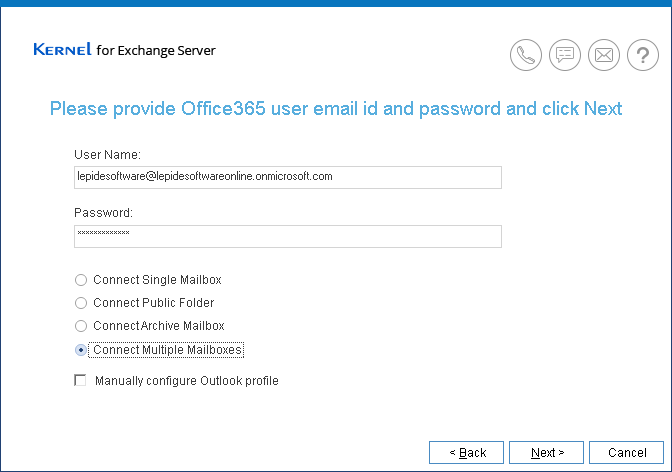 Migrate your Office 365 mailbox (also EDB, live Exchange) to another Office 365 user account. The program allows to conveniently move the single, multiple mailboxes, archive mailbox and public folders of Office 365 user account. The tool allows to export EDB file to EML and MSG files. Similarly, you can import content from EML and MSG files and save it the desired destination. The tool allows the flexibility to save all or selected attachments from the messages. The attachments can be extracted from Exchange mailbox, and EDB file, and restore it to the disk drive. You can refine attachments based on attachment name, type, and size. Extract your Exchange backup (BKF file) from various backup software like Windows NT Backup, Symantec Backup, HP Backup. 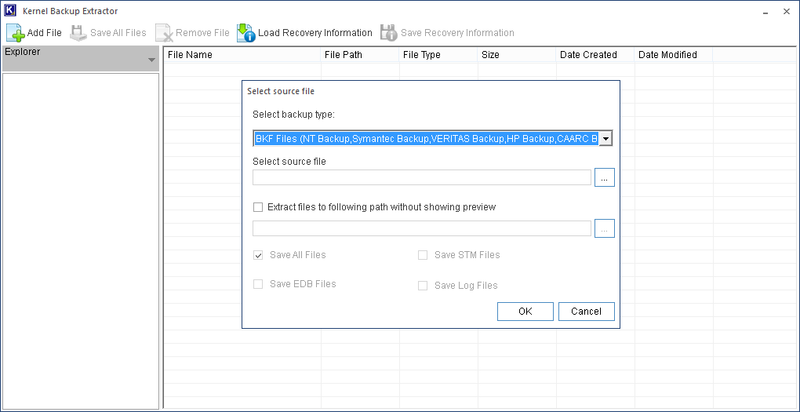 The tool also allows to restore backup file to EDB/STM file. 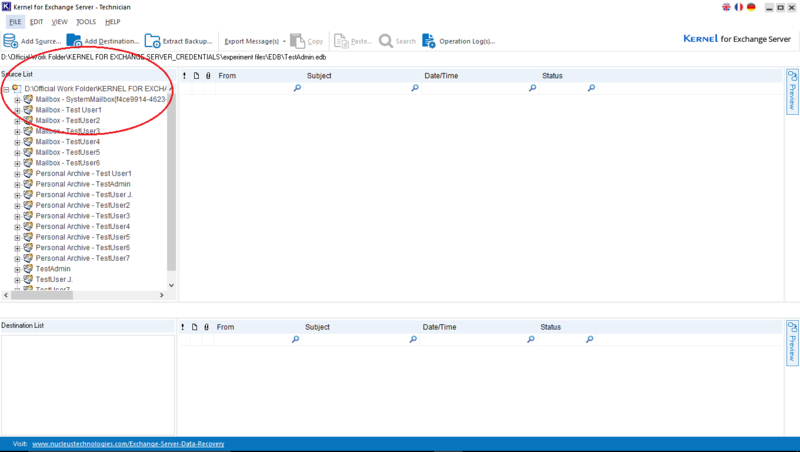 Afterwards, you can migrate the backup (EDB file) to live Exchange Server and other locations. 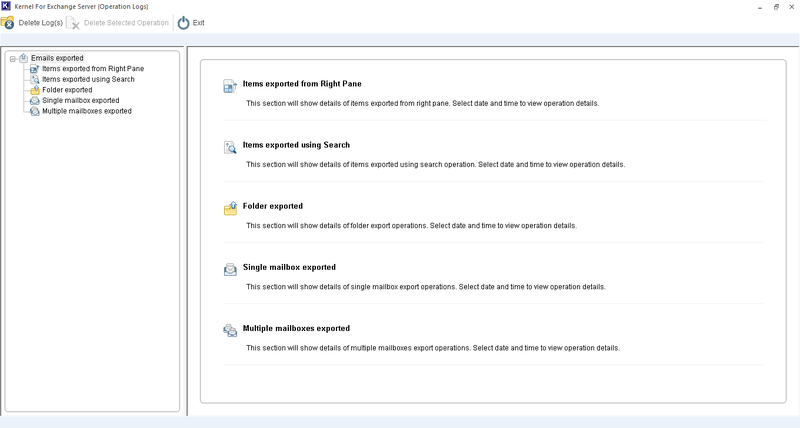 Kernel for Exchange Server tool generates logs of the import/export operations performed on the tool. The user can view detailed status, and summary of the emails exported from search, right pane, etc. Move all or selective messages from source to destination folder with copy/paste mailbox or drag-and-drop function. Our solution will take your offline exchange database (.edb ), scan and recover the data and then presents it in form of hierarchy as same as that of original EDB. You can preview your emails, attachments, contacts etc and then you can save it into either PST, Live Exchange or Office 365. Does it recover the data from the corrupt EDB? Yes.If your Exchange Database is corrupt or Exchange is in Dirty Shutdown state or there are other corruptions, then also you can recover your entire data with our solution. Does it recover deleted EDB folders? Is the tool capable of handling large exchange databases? Our tool has no file size limitations and can restore and migrate exchange database of any version irrespective of its size. Can I recover my Public Folder and Archive Mailbox? Can I save Single Mailbox? The tool provides you an option with which you can either save an individual mailbox/folder or multiple mailboxes/folders with complete folder hierarchy at one go. Can the tool create an individual PST for each individual mailbox? Yes.The tool can create a separate PST for each individual mailbox. Is there any size restriction on the PST created by the tool?